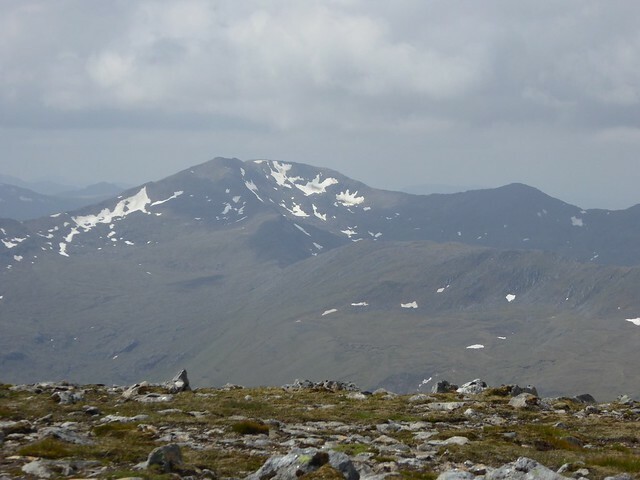 I'd been monitoring the weather for a few days, having identified the first weekend of June as one of my big, multi-Munro trips. 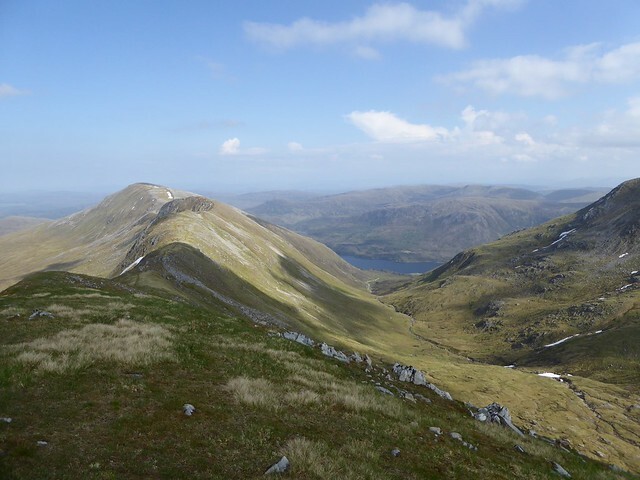 I'd been unable to take advantage of the good weather we had in the first half of May and felt I might have missed the Scottish summer by waiting so long to get my Munro bagging going again. However the forecast was looking very promising so I packed all my gear and threw it in the back of the car. Actually everything was carefully packed in my 60l rucksack! The plan was to walk into Glen Affric from the Glen Affric car park and camp at the bridge 2 km east of the youth hostel, at the bridge over the Allt Coire Ghaidheil. 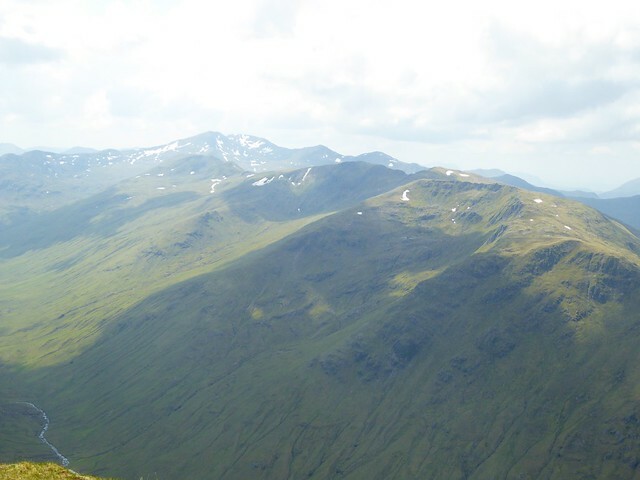 Day 1: the three westernmost Munros, Day 2: Mam Sodhail, Carn Eighe and Beinn Fhionnlaidh. I was walking in Glencoe on Friday in brilliant sunshine and was hopeful of a few hours of sunshine on Day 1 and wall-to-wall sunshine on Day 2. Things turned out a little differently and my physiological response was interesting, to say the least. It took me 2 hours to cover the 10km to my camping spot on Friday night. 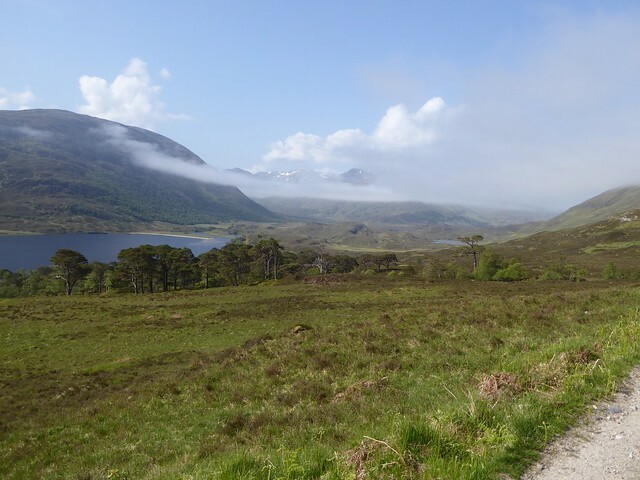 The track on the south side of Loch Affric is eminently cyclable, especially till the cottage, but because I don't currently have a serviceable saddle, the bike stayed at home. The glen was covered in thick mist so no sunset. It is however a lovely setting with beautiful Scots pines and a great beach on the east end of the loch, and the slight breeze ensured that the midges were not the plague they would expected to be in such dreich conditions. They were certainly a bloody hassle in the car park. I pitched up and retired for the night. Next morning (Day 1), there had been no change in the weather - it was gloomy in the thick mist. but there was a swirl and I was hopeful this was the sign that it would clear. But when? 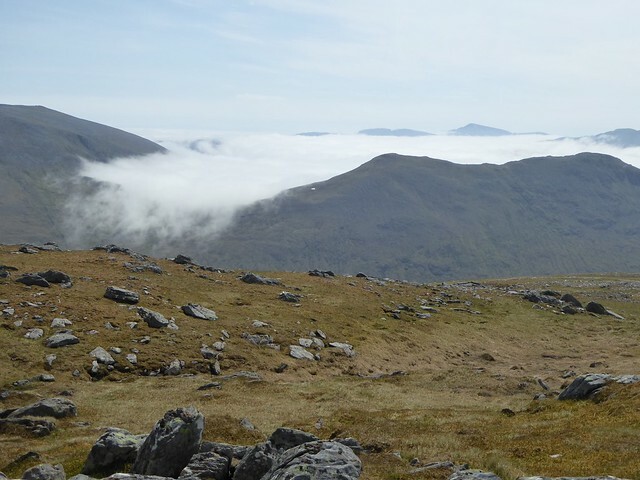 There appeared no point rushing and I made a slight adjustment to my plan - rather than start with An Socach, if it was still in mist, I would head straight for the furthest away Munro of the day - Mullach na Deiraghan - and then walk my way back round the horseshoe. Off we go... I walked towards the YH, left the track and headed across the bog towards the plantation. I slightly overshot the gate into the plantation and played catch up with the path as I headed further up the slope. I reached the ridge still in mist but that swirl was giving me some hope. 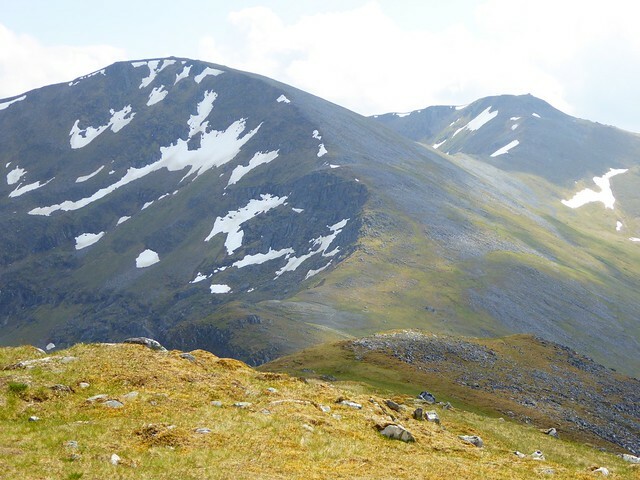 The route description threw me a little here - I got onto the ridge just each of the narrow bealach, between Stob Coire na Cloiche and another unnamed rise, by following the path marked on the map. My GPS seemed to confirm I was where I thought I was but I couldn't find the burn that the description mentioned (tip: look left, not right, for it). However sometimes chance events can unlock the situation. After a quick snack in the shelter of a rock at the foot of Stob Coire na Cloice, I got up intending to search for this faint path and suddenly a woman carrying a heavy pack came out of the mist, on her way down from Sgurr nan Ceathreamhnan and after the usual hellos and where are you headed (she was doing the whole 12!) she firmly encouraged me to go up the way she had come and check out the inversion. I hesitated as this wasn't my route but there was a quiet authority in her voice, allied with the desire for views so I climbed, postponing my search for the path down into corrie nan Dearcag. 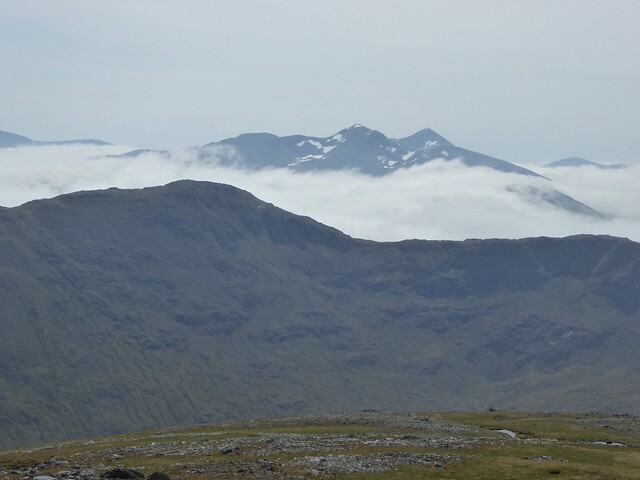 Sure enough, barely 10 metres up, I found myself gazing at the summits of Carn na Con Dhu and Deiraghain, then the mist ebbed and flowed for a bit and very slowly, dropped further down into the corrie revealing the whole horseshow Fab. 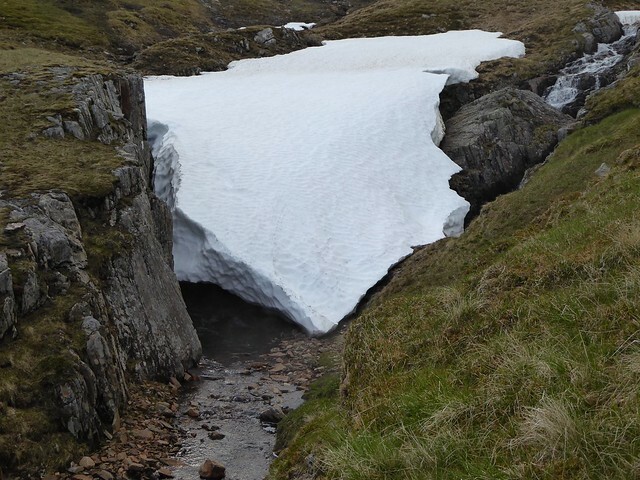 I was making my way back down to the bealach when I caught sight of the path I had been looking for 10 minutes earlier, and what could have been mistaken for the bed of a minor burn! I headed down and across (there is a wee pile of stones on a flat rock, just below the outflow of the lochans) in warm sunshine and quickly made my way up to the bealach south west of Carn na Con Dhu. It's actually quite a long way to its summit, a nice walk over boulders and undulations, and then an easy wander over to Deiraghan. Three colourful characters, their blue and orange shirts shining bright in the sunshine, just left the summit, heading towards me. I soon bumped into them. The Glasgow boys (artistic reference ) had just come up from Loch Mullardoch and were returning to the dam the next day over all the Glen Affric Munros. I caught up with them on the way back towards Sgurr nan Ceathreamhnan - unencumbered by heavy gear like they were, I was making swift progress. I wasn't sure how the weather was going to play out though. 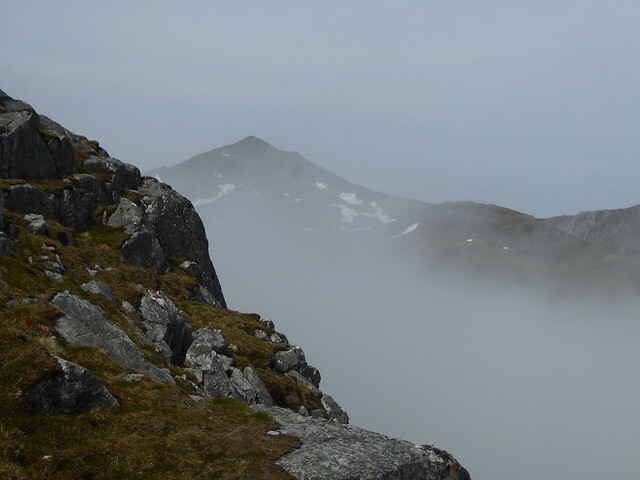 The forecast suggested clouds in the afternoon and I could see that Glen Affric was still shrouded in thick mist, with a wee lick hovering over into Gleann a' Choilich. 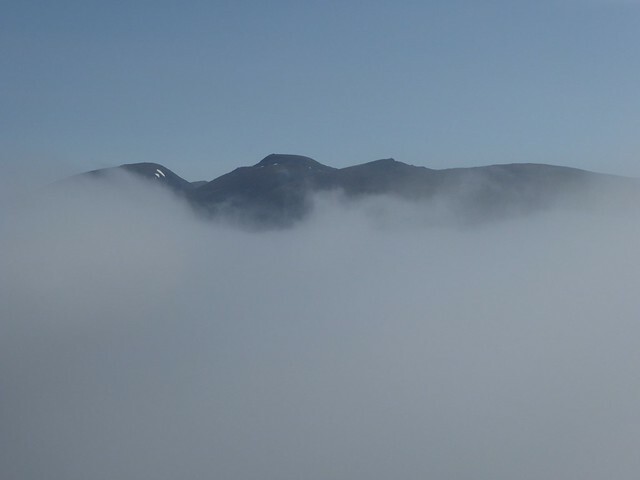 Unsure whether the mist would gain ground again, I was tempted to rush to the Sgurr to get the views. I need not have worried. Gradually all the glens cleared of mist and the beautiful weather settled for the day, well into the evening. The summit of Sgurr nan C. soon loomed and I bumped into a Munroamer (unbeknownst to me till a few days later) and a couple of chaps I met on the summit of Blah Bhein last October! The Dundee women appeared, dressed 'lightly' to cope with the heat and I recruited one of them to my research on women hillwalkers! 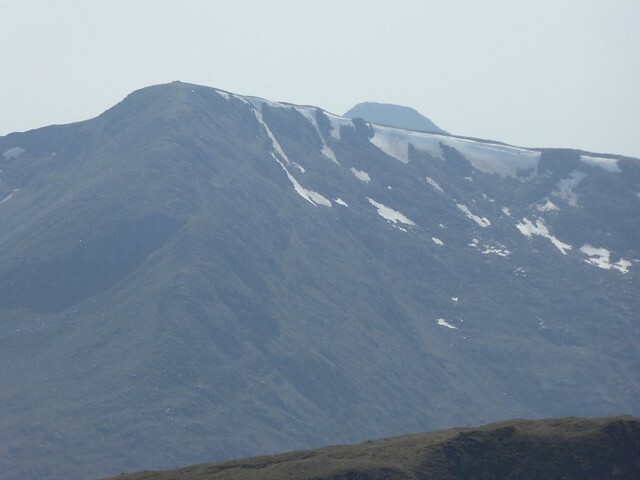 Meanwhile the views were lovely although there was a heat haze which kept the Torridon hills only just distinguishable. 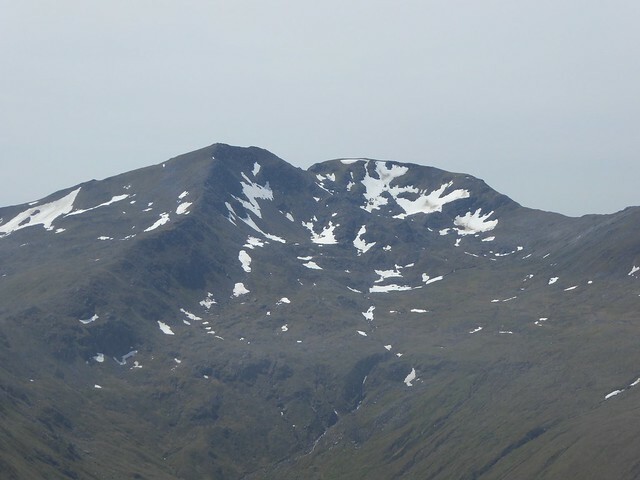 Closer up, Ciste Dubh dominated the views to the south and Day 2's target Munros were clearly etched against the clearer sky to the east. After much chat and banter with all and sundry, I eventually began the pleasant ridge walk back towards my landing point of the morning. 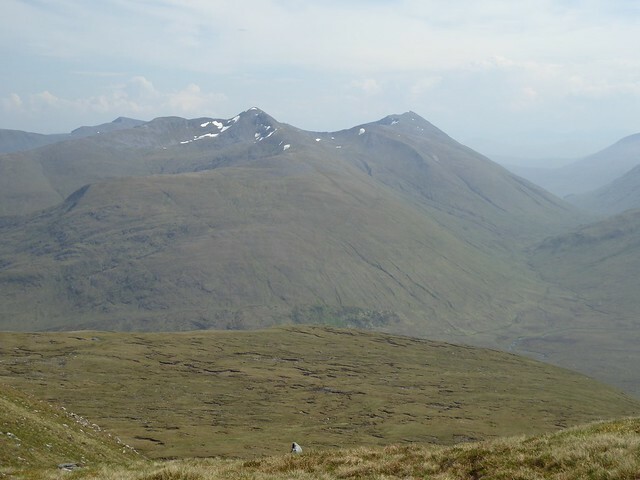 As I looked back I got great views of Beinn Fhada. 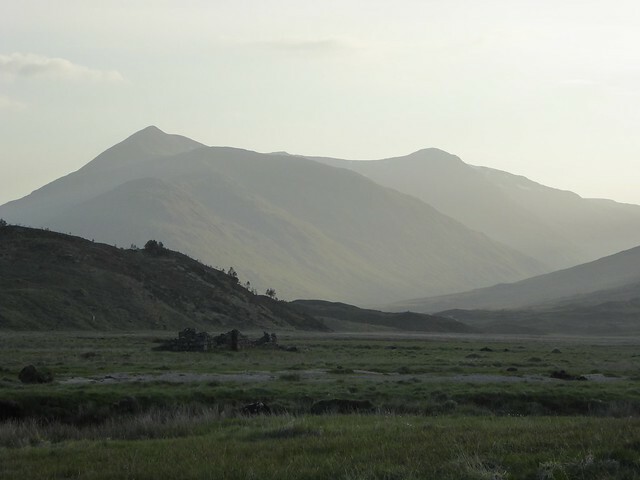 I began to hatch a plan - to have a dip in the river Affric back at the tent. 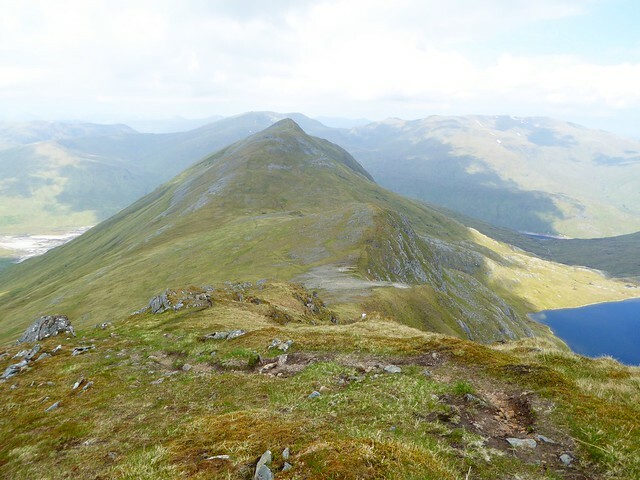 Time was getting on a bit so I switched up a gear as I still had to climb An Socach, my last Munro of the day. On the way there, I noticed a guy camping high on the shoulder before the last rise up to the summit, a great spot for a sunset. I caught up with the Glasgow boys again who were headed towards Mam Sodhail. I sensed some weariness at the prospect I started my descent round the south and east ridge of An Socach and was at the tent by 6pm. I flung my bag down ready to rush to the river for a wee dip, but then one of my tent neighbours had the same idea and beat me to it. I left him to it and headed down to the beach of stones and shingles as soon as he got decent again! My turn to strip off and tip toe into the water - brrrrr! It was bracing but it felt good to wash off the sweat. A splendid end to the day and despite the strengthening gusts, the glen was bathed in velvety sunlight till late on. A rare privilege for me. Day 2: Disappointingly I woke up to mist. I guessed it would clear earlier than the day before, so I busied myself with packing up all my gear. 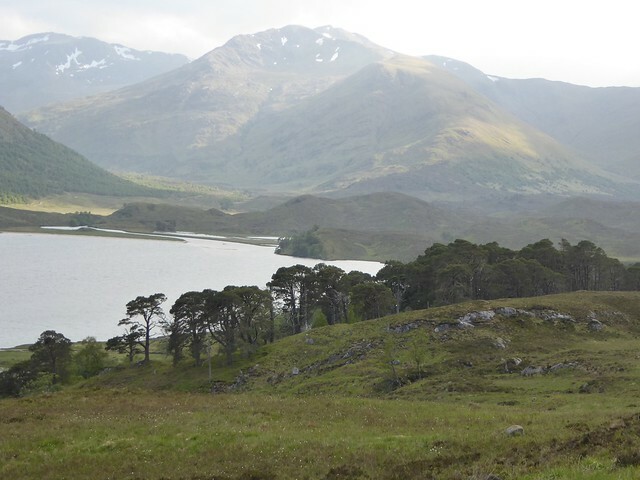 The plan was to walk back to a junction at Cnoc Fada where the path that skirts round the north side of Loch Affric starts. After 5km of swift walking, at the bridge, I left the heavy gear and walked up the drover's path up glen Leachavie. This is quite a long path which goes up to the head of the Coire. I hoped to find a route up the steep slopes onto the ridge east of a Cairn at the 1108m point and another 1km to Mam Sodhail. Just as I had reached the bridge over the Allt Coire Leachavie, the sun had burnt off the clouds and the Loch glistened in the sun. Everything was really bright and dazzling, a taste of things to come. The path seemed to go on for ever, quite a tough track, really bouldery in places, as if someone had come along and flung big stones carelessly. However I started brightly, stopped for fresh water and noticed a few pools in the Allt that would make great places to cool down, have a dip and a picnic. I think the heat was getting to me and it wasn't even 10am! After an hour, I began to struggle - every step was an effort, the sweat was pouring off me, I was stopping with increased frequency and I just felt discouraged. 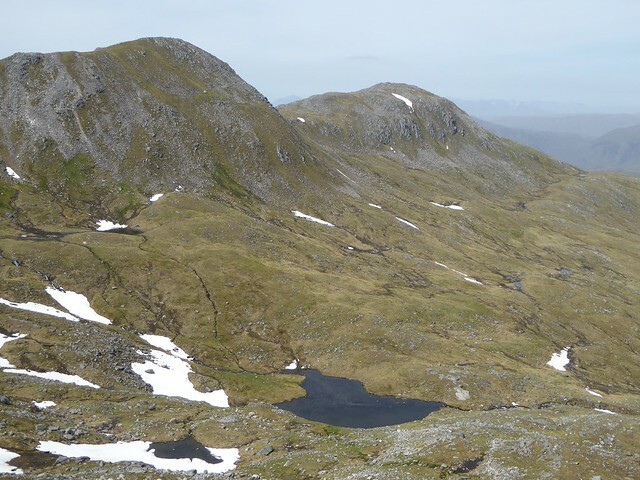 Once I got deeper into the coire, where the ground flattens, I stopped to drink from the burn and cool down a bit, and decided to head straight up for Mam Sodhail's south east ridge (that ends with Sgurr na Lapaich). It seemed eminently do-able, only perhaps a 150m of ascent and then a walk up to the first summit of the day. 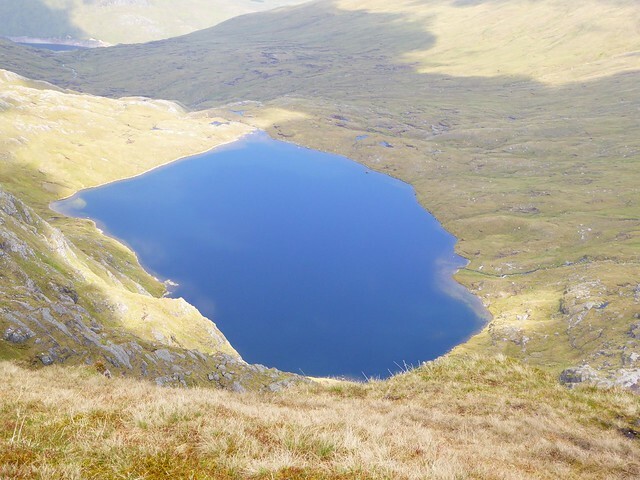 It seemed preferable to trudging under a truly burning sun for another 2km to the head of the coire and a long steep climb up cliffs which looked the opposite of inviting. So I struck across the boggy floor and soon started ascending. What a plod that was. My discomfort was getting worse and I was beginning to doubt that I would be able to reach the summit, let alone complete my round. I still made it onto the ridge, caught my breath, and turned left towards the summit. The gradient was marginally gentler but my body was not cooperating well at all and I found this last km torture; but at last I reached the huge hollow cairn of Mam Sodhail. I dropped heavily onto a stone and considered my situation. Just then, the man who was camping high the day before appeared - Willie was also really knackered, having endured his climb over An Socach with a full pack. I asked him if I could walk with him, hoping the company would take my mind off the pain! He abandoned his bag and we set off for Carn Eighe. Willie set off first and after a few minutes we followed. Not intending to return to the summit, we left our bags about a third of the way down and I felt beautifully light! I had to be because Keith was sauntering down over the bouldery slope like a mountain goat. Thank goodness he occasionally stopped to take pictures. We passed Willie as he was coming off the summit of Beinn Fhionnlaidh and when in turn we reached it, we lingered there for a bit. 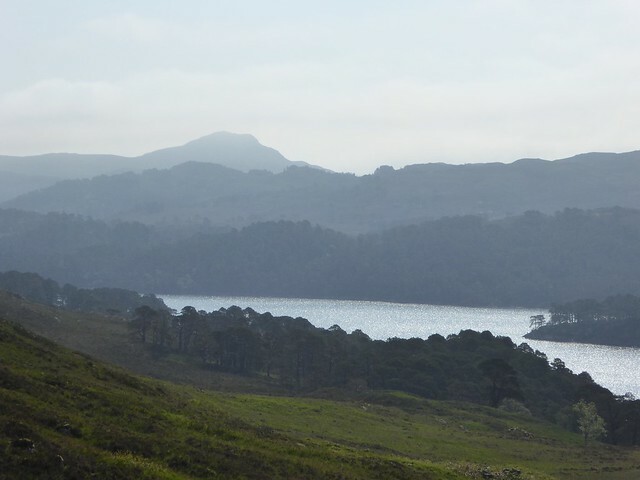 The water levels of Loch Mullardoch were quite low but the water was bright blue, the hills green, in contrast to their aspect only the previous June, when they looked brooding against cloudy skies and the loch was teal grey. The three of us set off down the ridge, Keith intending to go over Sgurr na Lapaich in case it gets promoted to Munro status. Willie changed his plan and came off the ridge with me to catch the track I had used on the way up. He was properly knackered by then and found the going down the slope quite tough. I disturbed a ptarmigan and her six chicks. I hope they were reunited. I left Willie by the Allt and I hope he made it safely back to the car park and home. His car was still there when I left. I wasted no time going back down the path, repacked my rucksack with the gear and headed down the track past the lodge to my car. This took a wee bit over an hour, up and over, across more lazily scattered rocks rolling under one's boots, through native woodland, past song birds flitting in and out of view. When the Lodge comes into view, you think you're nearly there, but not really. There's another 2km and the last stretch on the hard tho untarred road out of the estate is a real drag with a 'nice' steep hill just to test your mettle. I began to sing loudly first in French and then the Beatles When I'm 64! I don't know why. But it kept me going. When I at last reached the car park, I walked past a bunch of EU migrants enjoying the beautiful Scottish weather near their motor homes and I couldn't get to my car quickly enough to take my boots off and let my poor feet get some fresh air. I turned around and there was Keith who still had another 20 minutes to his own car. I took pity on him and gave him a lift to Chisholme Bridge! I then raced to Inverness, stopped to buy for water and noticed the pizza take away place. I lost no time and dived in, ordered, and when the pizza was ready, I devoured it in 10 minutes flat! I didnt dress up for dinner... I then set off down the A9 back to Falkirk. The road was mostly empty and I had daylight as far as Perth. The last 40 minutes were a bit tough but the prospect of my own comfy bed kept me awake and focused! 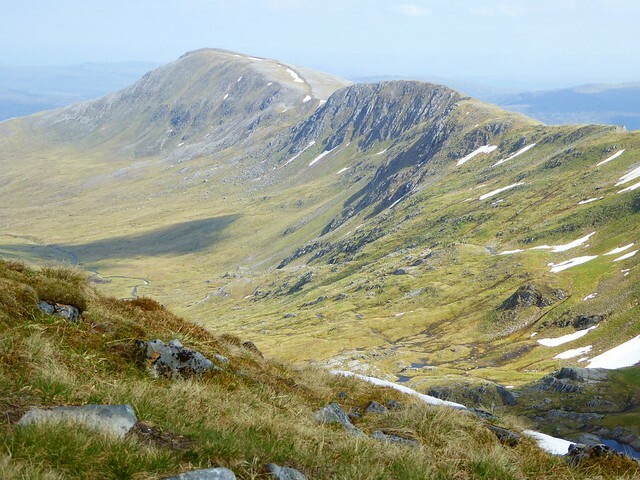 It's fair to say that my prospect to fulfill my goals on Sunday were compromised by what turned out to be a little bit of heatstroke and without the camaraderie of other walkers I might have turned back. So thanks Willie from Larkhall and Keith from Fyvie! I was up on the Sgurr nan Ceathreamhnan group on the 9th and had the same problems you had on your second day. The heat was almost suffocating and such was my dehydration I had to resort to drinking out of stagnant pools by swiping the surface and checking what was in my hand. I had cycled in, in the morning and the cycle out was the worst I have ever felt. Very entertaining report Emmanuelle! Thanks for the company & the entertaining conversation.